It's great to know that I usually buy all of my games new [/sarcasm]. If I could only get a few months behind the newly released games I would likely save a good chunk of money every year. Also of interest, Wii games have an average review score of 45.7 while the PS3 and 360 average in the 60's. I guess that shovelware talk isn't entirely false. What is the game in the first graph that didn't depreciate? Cory. The game that didn't drop in price at all was Kororinpa: Marble Mania for Wii. It has increased since December 2007 to just about $40. Cool article guys gotta love the regression analysis. The publisher analysis, sequel, movie based, amount of advertisement, current game revenue and game profit would all be great to see. Explanation of the outliers as well would be super cool. Ok so what about good games over a long period of time. Say Metal Gear Solid, Legend of Zelda and Final Fantasy 7. Do they appreciate over a long period of time? That sure explains why resistance fall of man is still 59.99 at best buy. What? Something is actually going DOWN in Price? No way, I wont believe it till I see it. It was getting so bad I was waiting for new games to show up used at Game Stop! They obviously only went to locations that had multiple competitors. Up here in Northern Ny. There is but one Gamestop. They have used games on the shelf that are over a year old and still selling for $45. So, I guess with this information, I can find out how long I will have to wait if I want to buy a USED game for 10 dollars cheaper. Anonymous - the data is based upon internet sales and they are resale prices, not new prices. Just to clarify. Anonymous - "what about good games over a long period?" Very good question. I will have to look into that. 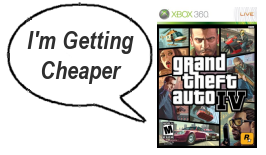 I would guess over a long period the difference between good and bad game prices would get even bigger. Look at how much the games you mentioned sell for compared to Spec Ops games. $20 vs $0.75 a huge difference. My guess is good games drop in price initially but then hit a point where they don't drop much anymore. Could you please post your data? It seems to me that you have to analyze your data according to a time series analysis to make sure that the price is indeed losing each value every day. What makes me believe is that you only do a simple regression over the average depreciation value per day which in itself may be misleading. Anonymous - The regression is based upon the average price drop per day for each game. If Game X's release price was $50 on Jan. 1 and then $20 on Dec. 31. The price drop per day for my analysis would be $0.082 per day. The prices do not drop exactly $0.08 per day, some days it drops more and some days it increases. This analysis assumed linear price drops over time. My guess is prices drop more initially and then slow down which is why I mentioned I want to analyze with the number of days since release as part of the equation to take this into account. Dan - Multiplayer support is a good variable to test out in the future. I have noticed a relationship like that too so it would be interesting to test. Thanks for the suggestion.